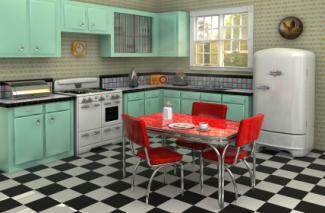 Decorating for a retro look is a fun way to introduce this cool style into your home. Retro interiors lend a unique design that can be integrated as individual conversation pieces or as a complete retro makeover for a specific room, such as a living room or kitchen. You may decide to redesign your entire home to reflect this nostalgic period style that spans several decades. It's up to you how far you take it. "Retro style" in interior design is a term used to describe designs from the 1950s, 1960s and 1970s, although the 1980s are beginning to be included under the "retro" umbrella. There are degrees in retro style that range from adding a few pieces to recreating an average vintage home interior from a particular time period. Beyond these varying degrees, some retro styles are a bit over the top in colors and use of materials. For this reason, retro style is not for the faint of heart or for people who prefer a more understated and classic décor. When you go retro, embracing the look shows that planning went into creating your home and that you haven't just failed to update your décor during the past decades. True vintage designs are highly sought after, so if you have a few gathering dust in your basement or attic, it's time to dust them off and integrate them into your new design plan. Not all retro designs are created equal, and each period has a very different flavor. Learn to distinguish between different periods in retro interiors that range from clean and modern to psychedelic. For the design aficionado, mid-century modern style still looks modern today. The movement emerged in the 1920s as a reaction to the Art Deco style and continued for decades. Sleek and minimal: It features sleek forms with minimal details. Famous designers: Well-known designers included the Eames (Charles and Ray), Mies van der Rohe and Eero Saarinen, who were also architects. 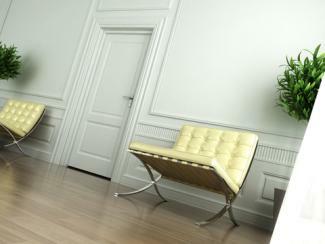 Retro chairs: Classic pieces like the Barcelona Chair or the Womb Chair are a must for serious retro collections. When you think of the 1950s, the classic diner look probably comes to mind. Color schemes: Popular color schemes included a black and white checkered tile floor, with bold accents such as cherry red, turquoise and hot pink. Classic materials: The predominate materials for furniture and other finishes were light woods, chrome, vinyl, Formica countertops and Plexiglas. Diner style: Since this period translates well for kitchen design, consider adding banquette seating to your kitchen or a couple of 50s diner style bar stools at your breakfast counter. 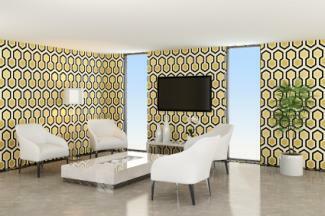 The television show Mad Men does a fantastic job in recreating stylish 1960s interiors. Popular colors: Decorate with avocado green, copper, orange or mustard yellow paired with beige. Wallpaper: Wallpaper became very popular during this period, especially flocked wallpapers. There are many 1960s reproductions of patterns such as paisley or florals for sale today. Classic furniture: Look for molded plastic and pod-shaped chairs, as well as streamlined, wooden Danish furniture including desks, coffee tables and storage cabinets. Other accessories: Finish the look with Andy Warhol inspired pop art and, of course, a shag rug. If you really want to go 60s retro, you'll need a lava lamp and oversize beanbag chair. Sofas: Get your groove on with these cool modern sofa choices. Decor in the 1970s shares a lot in common with the 60s. Brighter colors: The wallpapers of the 1970s were reflective foils, bamboo patterns and grasscloth. Flashier rugs: The length of shag rugs got longer and the fabric patterns popped bolder. Kitchen colors: Autumn colors such as orange, rust, brown and harvest gold were highly sought-after, and making sure that your kitchen appliances all matched became a must. Change in materials: Popular surface finishes included wood paneled walls, heavy draperies with padded valances, dark wood stains, rattan and wicker furniture and paisley prints for just about everything. You can bring a retro look into your decorating scheme through the use of retro colors, fabrics, furniture, art and appliances. Whenever you think of the homes during the mid-20th century, specific colors come to mind. Avocado green had staying power, and adding this color to your décor is one of the quickest ways to create a solid base for building your retro look. Any of these colors can be used to create an effective retro design and really tie your design together. 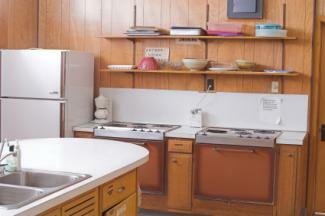 When it comes to retro appliances, the shape, material and color matter. During the 50s and 60s, round edges were de rigeur (compulsory) for appliances. 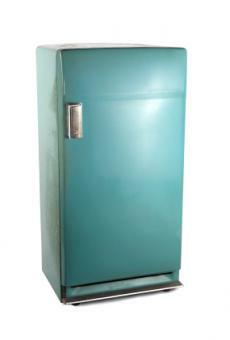 For a good example, check out retro style Smeg refrigerators. Look for these rounded edges on all of your appliances. You can carry this theme throughout to your furniture as well. When it comes to materials and colors for applicances, chrome is the order of the day. Chrome fridges, countertops, tables, stovetops - as much as you like. If you want to change things up a little bit, swap a few of the chrome appliances for ones that are in the colors of the time period - an avocado stovetop or a red dishwasher will also look great. Circa 50: Circa 50 offers cool, modern takes on retro styles, and they have free shipping. 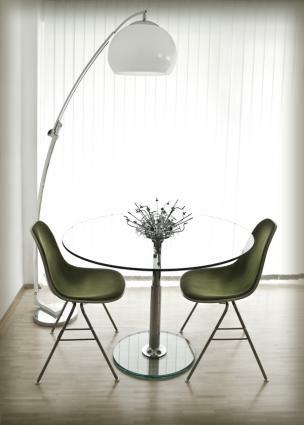 Vintage Looks: Offers classic modern and retro furniture from the 50s, 60s and 70s. Hi Lo Modern: This site offers modern interpretations of classic retro looks. Lots of fun! Now that you're ready to go retro, determine the era you relate to best. Consider the colors, designs and styles of each era and how you feel when surrounded by them. Does a particular era feel like home to you? Develop a design plan, starting with walls and floors and then begin your search for furniture and accessories. Take your time and source each item so you're sure to have the right piece to add to your design collection.